St. Stephen, one of the seven deacons mentioned in Acts of Apostles, was the first martyr of a fledgling Church. 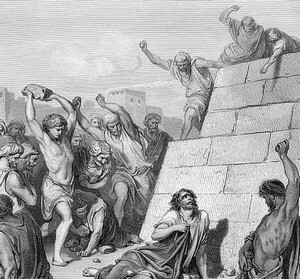 He was stoned to death by followers of Saul (later known as Paul) for proclaiming the Gospel of Jesus Christ. Here is the account from Acts of Apostles. But Stephen, filled with the Holy Spirit, gazed into heaven and saw the glory of God, and Jesus standing at God's right hand. 'I can see heaven thrown open' he said 'and the Son of Man standing at the right hand of God.' At this all the members of the council shouted out and stopped their ears with their hands; then they all rushed at him, sent him out of the city and stoned him. The witnesses put down their clothes at the feet of a young man called Saul. As they were stoning him, Stephen said in invocation, 'Lord Jesus, receive my spirit'. Then he knelt down and said aloud, 'Lord, do not hold this sin against them'; and with these words he fell asleep. Saul entirely approved of the killing . . ."
Like Jesus before him, Stephen offered up his spirit to the Father, and forgave his executioners.Tradion had it that Stephen's forgiveness of, and prayer for, those that had stoned him, led to the conversion of Saul, (see Acts of Apostles, Chapter 9), who had conspired in his murder.